"Every once in a while, a book comes along that smashes the mold of the typical Wall Street trading book..."
Trading Sardines is not just a spirited book on trading, it's a Ph.D in market experience summed up in 315 entertaining pages. Trading Sardines celebrates grit and resilience in the financial markets. It is a hilarious, honest, and poignant account of the evolution of a professional trader over nearly four decades. From the raucous trading floors of the early eighties to the days of giant server racks thirty years later, the reader takes a chronological trip through the markets, trading strategies, and unimaginable events, watching how one woman responds with unblinking honesty. Linda Raschke shares a lifetime of market lessons while highlighting the tension between luck, risk, and passion. Along the way, she shows that perseverance can overcome the most inconceivable challenges, both in life and in trading. Her stories, documented with charts and photos, will keep you captivated and prove that humor may just be the key ingredient for survival. You won’t hear these types of tales anywhere else–this is the REAL world of trading. This book will motivate every trader, no matter the level of proficiency and experience. Linda’s success is testimony that you don’t have to be perfect, you just have to stay in the game. “Salty, earthy, filled with words of wisdom. Trading Sardines is a wonderful biographical sketch of a female pioneer in the male-dominated trading pits. Sardines traces Linda’s outstanding and successful journey as an equities and futures trader from LA to San Francisco to New Jersey to Florida to Chicago. This book shares more one-liners of wisdom – and in a hilarious fashion – than any trading book I have read. After reading Sardines readers will fully understand why Raschke was featured in the Market Wizards series. I highly recommend this wonderful human interest story of a trader I have long admired and considered a friend." "After years of wonderful market calls, Linda is once again operating 'out-of-the-box'. This time she is combining fun with finance". "Not since Reminiscences Of A Stock Operator has there been a no holds barred tell-all book about the life of a trader. In this day and age of get rich quick false prophets, it sure is nice to read about a real trader - someone who had dedicated their life-at-all costs to become successful. Linda gives you an in-depth look into the trials and tribulations of being a trader - warts and all. Interspersed throughout her amusing anecdotes and hard knock life lessons, she gives you some gems about trading and how the market really works. Whether you're new to trading or a seasoned pro, Trading Sardines, is a must read, destined to become a Wall Street classic." 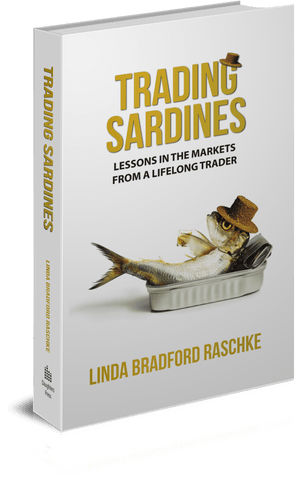 “Whether you are a newbie trader or already highly successful, you will find “Trading Sardines” a fascinating and eye-opening read, as Linda takes us on an exhilarating journey behind the scenes revealing the harsh realities of what it takes to join the league of the world’s best traders. You will be moved between cringing and hysterically laughing, when Linda tells in her unique witty style the stories of the tribulations and triumphs she encountered in her 40-year trading career. The stories are imbued with rare insights, priceless wisdom and practical solutions that Linda discovered when she overcame the adversities life threw at her." 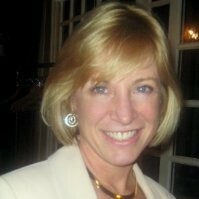 Linda Bradford Raschke (born 1959) is an American trader, investor and hedge fund manager. She held memberships on the Pacific Stock Exchange and the Philadelphia Stock Exchange in the early eighties before founding LBRGRoup, a CTA (Commodity Trading Advisor). She started several successful hedge funds, both onshore and offshore, and rose to the top of the ranks in hedge fund performance. She is mentioned in many trading books, including Jack Schwager’s New Market Wizards. She lives in Florida and Illinois with her husband Damon, and her horses, where she continues to actively trade and invest. She holds a BA in Economics and in Music Composition from Occidental College (1980). This book is printed by Thomson Reuters on the highest quality paper with a linen finish clothbound hardcover and glossy dust jacket. It weighs OVER 1 1/2 pounds. How did you like the book? please come back and leave a review! This is an outstanding piece of work. Much different from your 'traditional' trading book. Great insight into the psychology of a successful trader as well a proven tale about how deploying consistent effort in your studies can pay off in the long run. While reading, you will feel as if you are sitting beside Linda having a chat about her life's journeys with lots of great jokes and puns! Highly suggest this book for both traders and non-traders alike! “Give and everything you give will come back to you tenfold. Stay humble but remain confident.”- Linda Bradford Raschke, Trading Sardines, pg. 304, 2018. Trading Sardines gives the reader a first-row seat into how Linda practices what she preaches- putting giving and humility at the forefront. Even before reading her book, after listening to her in countless seminars (which are available online for nothing) her caring spirit and avidity for the markets won me over. In 2019, it is en vogue to brag both in life and the financial markets. Linda is genuine in an industry that compels people to, in her words, “brag, boast, fib, tell white lies, and outright untruths about their performance.” What makes this so powerful is that after reading, you realize that she, above all others, would have the right to brag to anyone and everyone about her life, her struggles and her successes. But she doesn’t. And that humility comes through as power and hope for all who aspire to greatness. Linda’s frank discussions on the realities of trading, variance levels in capital, the importance of hitting singles and countless other gems of wisdom are priceless, especially to the newbie. Entertaining and funny- my family is NOT happy because I’m now intent on going out and buying a parrot and naming it Sara so it can squawk out my trade alerts for me too! If only I had known THAT was the secret from the very beginning! This newbie trader gives Trading Sardines the highest recommendation that a newbie could.